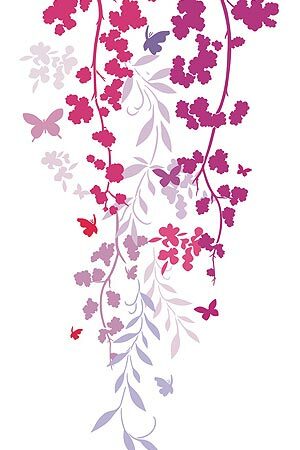 The Blossom and Butterfly Stencil features tumbling cherry blossom motifs, little mimosa flowers, graceful falling willow leaves and 11 little butterfly motifs! See size specifications and layout below. 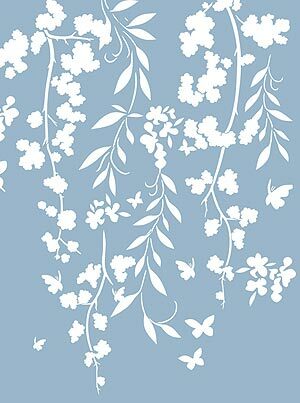 Henny’s simple blossom stencils are perfect for creating modern silhouette designs on walls, fabric and furniture. Use multi coloured schemes of bold and pastel colours for impact and dimension. Or stencil in one colour on contrasting backgrounds for stronger silhouette effects. Use our Stencil Rollers for perfect results with this stencil. 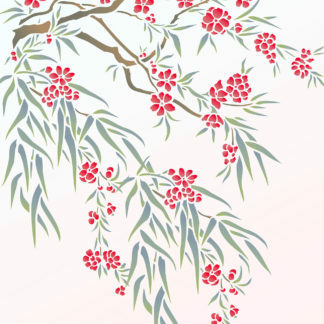 The blossom motifs can be overlapped or used apart. Use Low Tack Stencil Tape to mask off the different motifs and create a multitude of different designs to fit any require shape. Some examples of effects that can be achieved with this design are shown on this page. Above – close up details of some of the motifs of this stencil, arranged in an overlapping sequence in Indian Purple, Plum Blossom, Very Berry, Azalea and Cerise Stencil Paints. Above left – Motif Stencil Paints used Kingfisher, Very Berry, Harvest Gold, Verbena. Right – Very Berry, Cerise, Orchid, Harvest Gold and Forget-me-not. 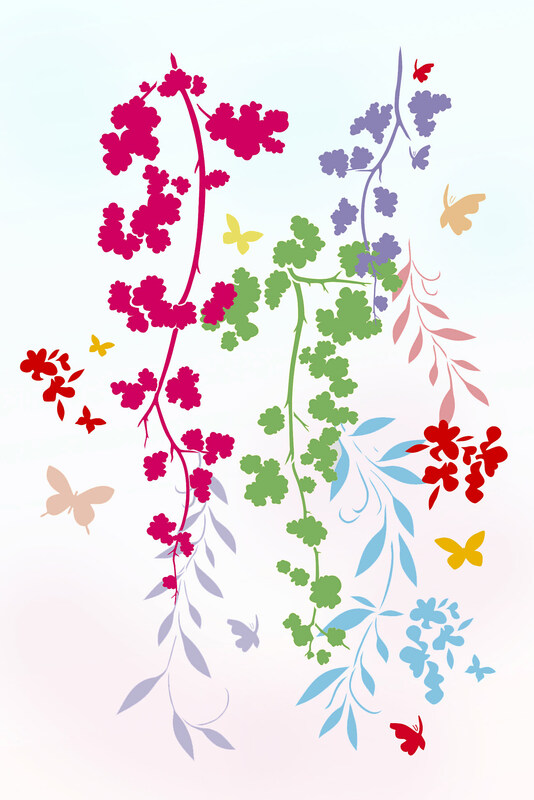 See also the oversize version of this design the Falling Blossom Stencil. Stencil this design with our Stencil Paint or Fabric Paint ranges and our Stencil Rollers and Stencil Sponges. Above – the motifs of the Blossom and Butterfly Stencil have been stencilled in a random, overlapping, cascading arrangement on a decorative panel. 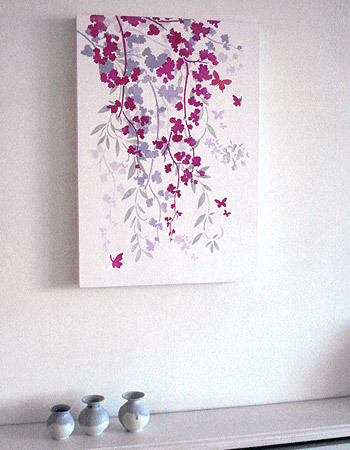 Stencilled in Cerise, Very Berry, Indian Purple, Forget-me-not, French Lavender, Plum Blossom and Willow Stencil Paints. 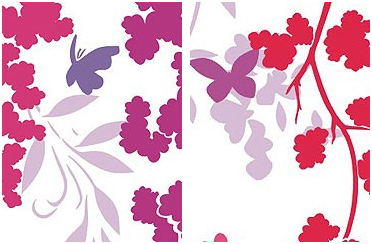 Above – the different motifs of the Blossom and Butterfly Stencil in an overlapping random sequence in Cerise, Very Berry, Plum Blossom, Forget-me-not, Alba Rose and Buttrscotch Stencil Paints. 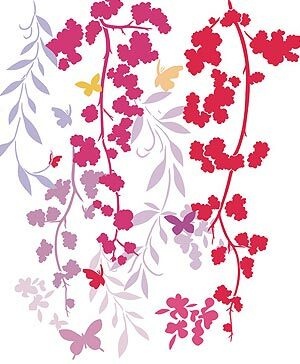 Above – the different motifs of this stencil in an overlapping vertical, tapering sequence in Plum Blossom, Forget-me-not, Indian Purple, Alba Rose and Azalea Stencil Paints. Above – the different motifs of the Blossom and Butterfly Stencil in an overlapping random sequence in Ice White Stencil Paint on a chalky blue background. Easy to use one layer one sheet stencil. See below for sheet layout. 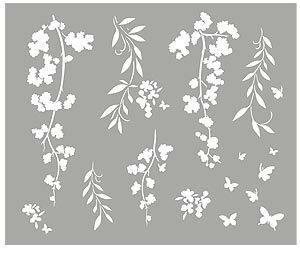 The motifs can be used singly or grouped together to create any desired flower silhouette effect – use low tack tape to mask off motifs not being stencilled. 1. Three Cherry Blossom motifs – largest 11cm (4 1/4″) wide x 34cm (13 1/2″) deep, smallest at 6cm (2 1/2″) wide x 17cm (6 3/4″) deep. 2. Three Willow motifs ranging from largest at 7cm (2 3/4″) wide x 20cm (8″) deep, to smallest at 6cm (2 1/4″) wide by 7cm (2 3/4″) deep. 3. Two Mimosa motifs up to 6.5cm (2 1/2″”) wide x 6.5cm (2 1/2″) deep . 4. Butterflies (11) in a range of sizes from 1cm (1/2″”) across wing span to 4.5cm (1 3/4″) across. All motifs arranged on one sheet 60cm (23 1/2″) wide x 43cm (17″) deep. 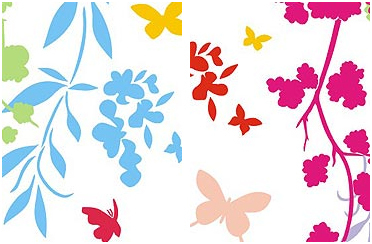 Left – the layout of the stencil sheet of the Blossom and Butterfly Stencil.